Massachusetts advanced to the national title game for the first time ever, topping Denver, 4-3 in overtime, in the Frozen Four semifinal on Thursday night. Marc Del Gaizo (Basking Ridge, N.J.) scored the game-winning goal in overtime and also added an assist in the game. For his efforts, the freshman defenseman was named to the 2019 Frozen Four All Tournament Team. The Minutemen fell to Minnesota Duluth, 3-0, in the title game. Minuteman defenseman Cale Makar (Calgary, Alta.) was named the 39th Hobey Baker Award Winner on Friday night. Makar becomes the 11th player in Hockey East history to collect college hockey's highest indivi ual award and the second in as many years after Northeastern's Adam Gaudette took home the title in 2018. 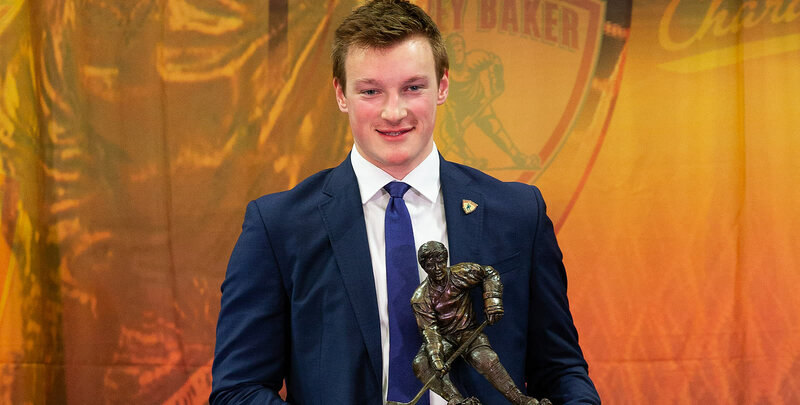 It marks the first time since Boston College' s Johnny Gaudreau and Boston University's Jack Eichel were so honored in consecutive seasons in 2014 and 2015 that a conference has taken the Hobey Baker in back-to-back seasons. It is the fourth Hobey Baker award for Hockey East in the last six seasons and the third time a league defenseman took home the award (Mike Mottau, Boston College, 2000; Matt Gilroy, Boston University, 2009). 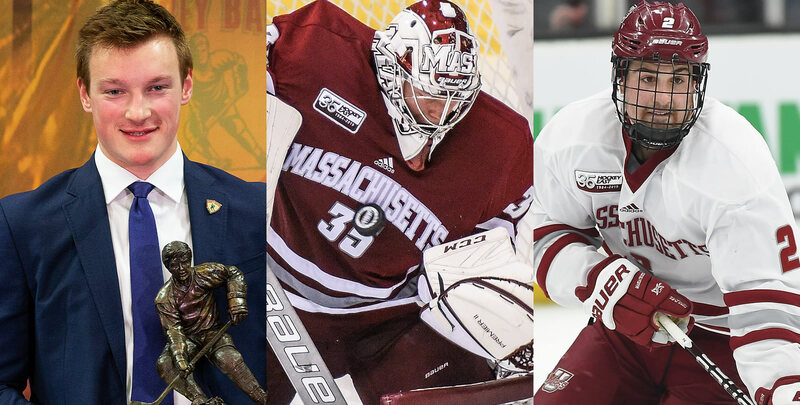 Hockey East ended the season with the Hobey Baker Winner (Makar), the national coach of the year in Spencer Penrose Award Winner Greg Carvel (UMass), the national rookie of the year in Tim Taylor Award winner Joel Farabee (BU) the national goaltender of the year in Mike Richter Award winner Cayden Primeau (NU.) The league also took home six of the 12 All-Americans as Primeau, Makar, Mitchell Chaffee (UMass), David Cotton (BC), Josh Wilkins (PC), and Jeremy Davies (NU) were so honored on Friday. Providence's Josh Wilkins (Raleigh, N.C.) scored his 20th goal of the season in the Frozen Four semifinal, a 4-1 loss to eventual national champion Minnesota Duluth. Cale Makar (Calgary, Alta.) was named the 2019 Hobey Baker Award winner on Friday in Buffalo, Makar is the 11th player in Hockey East history to collect college hockey's highest individual award and the second in as many years. Makar also picked up an assist in Thursday's national semifinal win over Denver and helped anchor the Minutemen defense to the national championship game for the first time ever. 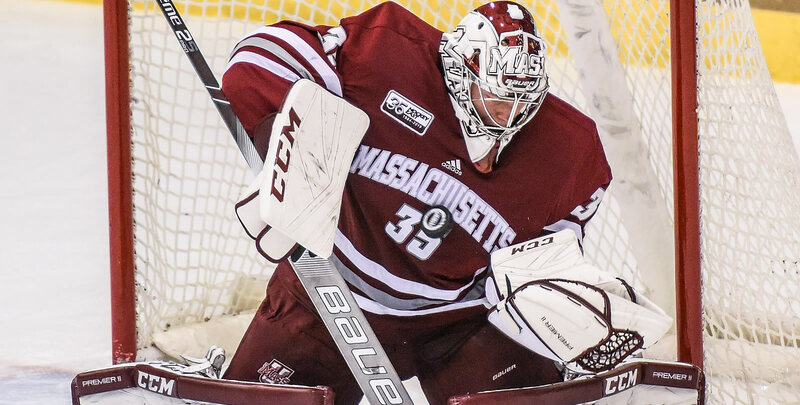 Filip Lindberg (Espoo, Finland) stopped 65 shots in the Frozen Four, backboning UMass to the first Frozen Four win in program history and first title game appearance for the Minutemen. His weekend included 37 stops in the national semifinal, including five in overtime. Marc Del Gaizo (Basking Ridge, N.J.) scored the game-winning goal in overtime of Thursday's national semifinal, lifting Massachusetts to its first-ever national title game appearance. He also added an assist in the game. For his efforts, the freshman defenseman was named to the 2019 Frozen Four All Tournament Team. Jake Gaudet, UMass (So., F; Ottawa, Ont.) 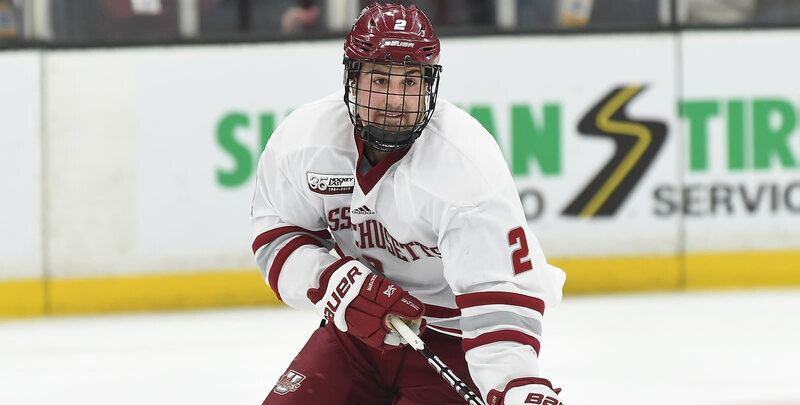 Dished out two assists, including a helper on the overtime game-winning goal in the national semifinal, to help UMass into the national title game. John Leonard, UMass (So., F; Amherst, Mass.) Scored a power-play goal in the Frozen Four semifinal against Denver, increasing Massachusetts's lead to 3-1 in the first period. Josh Wilkins, PC (Raleigh, N.C.) Scored his 20th goal of the season in the Frozen Four semifinal, an 4-1 loss to eventual national champion Minnesota Duluth.